The people of ancient Egypt believed their kings were also gods. Modern people refer to ancient Egyptian rulers as pharaohs, but pharaoh originally referred to the palace where the king lived. Pharaoh was not used as a title for the Egyptian ruler until the later part of ancient Egyptian history, but today we use the term to describe all of the rulers of ancient Egypt. Legends say that Egypt was once two kingdoms: a lower kingdom in the north and an upper kingdom in the south. Southern Egypt is on higher land than northern Egypt, so unlike most rivers, the Nile River flows north. Menes (MEN-es) came from a village in Upper Egypt. About 3100BCE, Menes became the first ruler of a united Egypt when he conquered Lower Egypt. Menes wore a double crown of red and white that symbolized the unification of Upper Egypt and Lower Egypt. The Egyptians believed the crown had magic powers; it was the single item an Egyptian ruler could not take with him to the afterlife. A historian named Manetho reported that Menes ruled Egypt for 62 years and was killed by a hippopotamus. We cannot be certain of Manetho’s account because he lived almost 2,000 years after Menes. Manetho also wrote of Hatshepsut, a woman pharaoh who wore a fake beard and dressed as a man. Around 1500BCE, Hatshepsut married her half-brother, the pharaoh Thutmose II. Royal families often intermarried because they did not want to produce children with common people. Thutmose II had a son, Thutmose III, by another wife. When Thutmose II died, his son became pharaoh, but Hatshepsut served as regent because Thutmose III was too young to govern Egypt. A regent is someone who governs for a monarch who is too young to rule. Once Thutmose III was old enough, he and Hatshepsut ruled Egypt together, but when Hatshepsut suddenly disappeared, Thutmose destroyed Hatshepsut’s shrines and statues. The ancient Egyptians were polytheistic, which means they believed in many gods, but about 1350BCE, the pharaoh Amenhotep IV came to believe that Aton, a god of the sun, controlled all of the other gods. Amenhotep IV changed his name to Akhenaton, a name that means “he who is beneficial to Aton.” Akhenaton seized the temples to other gods, removed the Egyptians priests from power, and forbade the people from worshipping any god but Aton. 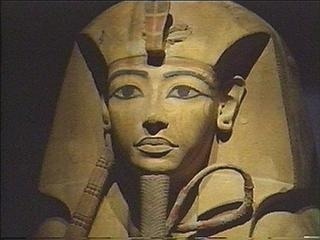 Akhenaton and Queen Nefertiti built great statues to Aton and ordered that statues honoring any other god be destroyed. Most Egyptians did not take the faith of their leaders, and later rulers returned to their traditional beliefs. A nine-year-old boy named Tutankhamen became pharaoh shortly after Akhenaton’s death. The “boy king” never became a “man king” because he died of a head injury only nine years into his rule. Tutankhamen reign was unremarkable, but Tutankhamen is remembered most for the treasures found in his tomb. Thieves robbed most of the pyramids over the centuries, but by accident Tutankhamen’s tomb remained intact because it was buried by rock chips dumped from the cutting of a tomb of a later pharaoh. Tutankhamen’s treasures remained hidden for more than three thousand years until British archaeologist Howard Carter discovered the boy king’s resting place in 1922. Egypt’s most powerful pharaoh was Ramses II, who led armies that conquered many faraway lands. Ramses II did not build a great empire because he believed the land and culture of Egypt was superior to all others. Instead, Ramses II’s army forced the conquered lands to pay tribute. Tribute is payment for protection. Ramses II used his wealth to build palaces and temples throughout Egypt. By the time of his death in 1213BCE, Ramses II built more monuments than any other pharaoh.